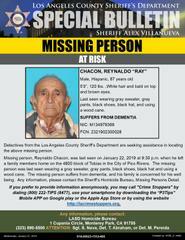 Los Angeles County Sheriff’s Department’s Missing Persons Unit Detectives are seeking the public’s assistance in locating Reynaldo “Ray” Chacon. 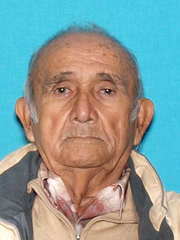 He is an 87 year-old male, Hispanic, last seen on Tuesday, January 22, 2019, at 9:30 a.m. on the 4800 block of Tobias Avenue in the City of Pico Rivera. Mr. Chacon is described as 5’0”, 120 lbs., bald on top of head with white hair on the sides and brown eyes. He was last seen wearing a gray sweater, gray pants, black shoes, black hat, and using a wood cane. Mr. Chacon suffers from dementia and his family is very concerned and for the public’s help in locating him.